I love broccoli. I really, really love broccoli. I love to roast it – Roasted Broccoli with Garlic & Parm. I love it in a salad – Kale & Broccoli Salad. And I love to soup it – Broccoli Cheddar Potato Soup. I. LOVE. BROCCOLI. I can say this with certainty now but for years I wasn’t sure if I loved broccoli or if I loved it because almost every time I ate it there was CHEESE (my first true love, but please don’t tell broccoli). If you’re a soup fiend like I am feel free to swap out the broccoli for cauliflower, or carrots. Add a few minutes to your cooking time — cauliflower and carrots will take a bit longer to cook — and you can simmer up a batch of any creamy veggie soup in minutes! The “creamy” comes from the addition of either heavy cream or half-and-half. Cream will give you a more velvety soup (obviously) but half-and-half is just as tasty and not quite so fatty if you’re worried about calories and such. Simmer your soup once you’ve added your cream or half-and-half but DON’T let it boil. Too much heat and the fat in your dairy will separate, leaving a weird, unappetizing oily ring on the surface of your soup. Not harmful, but not so pretty. I like to use fresh broccoli florets, either cut from a head of broccoli or the pre-cut bagged version. It’s usually less expensive to buy the head and cut it yourself but if you’re short on time or knife skills, grab a bag of pre-cut or frozen florets. Yes, you can use frozen broccoli (or other veggies)! Fresh is best (IMO) but frozen is a close second. Here’s the one change you’ll need to make if you’re using frozen broccoli. Don’t add the frozen broccoli (don’t bother thawing it) until after you’ve added the chicken stock and brought it to a boil. Heat your olive oil. Add your onions, garlic, spices. Stir in the stock. Bring it to a boil then add your frozen broccoli. Reduce heat until the stock simmers the broccoli fork-tender. That’s it! Frozen veggies will cook up much faster than fresh so you can tuck into this gorgeous soup sooner rather than later! 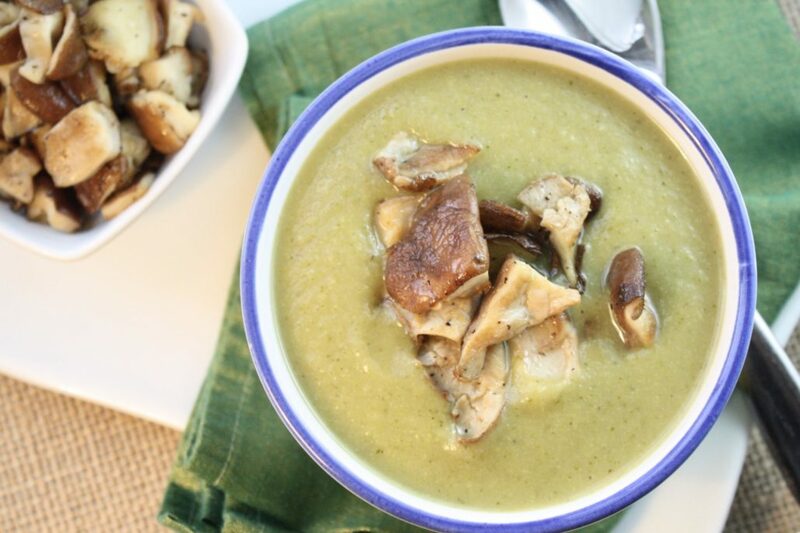 Now that I’ve shared my broccoli love with you, make this soup. When you do, share a picture with me on Facebook, Twitter or IG so I can celebrate your love of broccoli, too. Just please, don’t tell cheese! 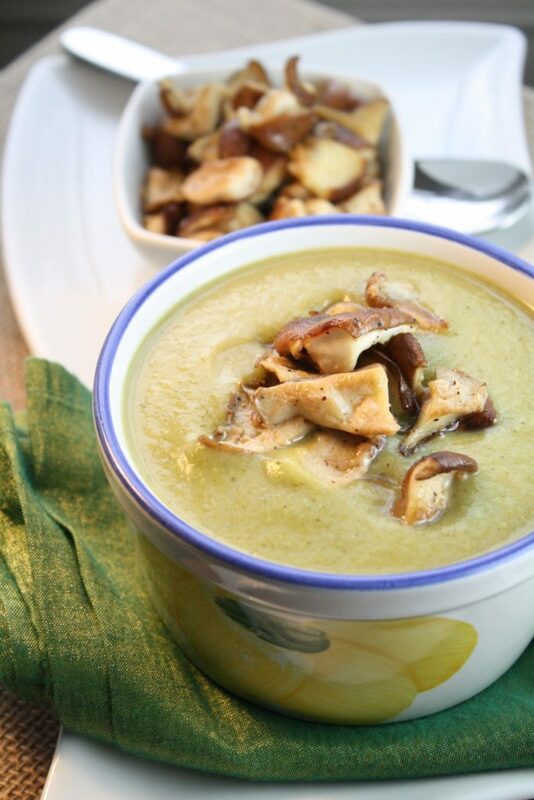 Don’t be afraid to use a bit of the broccoli stalk in your soup. It holds a ton of flavor! Chop it in small pieces and add a few minutes to your cooking time if you use them. Be sure not to let the soup boil after you’ve added the cream or half and half. Too much heat can cause the fat to separate, leaving an oily ring on the surface of your soup. occasionally, until vegetables begin to soften, 3-5 minutes. Stir in red pepper and nutmeg and cook an additional minute. Add stock and bring to a boil. Reduce heat until soup simmers. Cover and simmer until broccoli is tender, 7-10 minutes. Carefully ladle soup into blender and process until smooth. Return to pot and stir in cream or half and half. mushrooms begin to brown, 5-7 minutes. Ladle soup into four bowls. 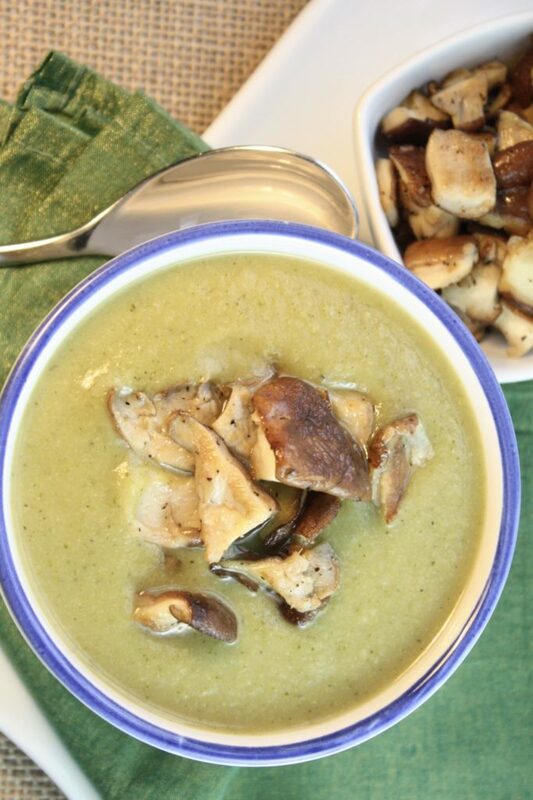 Spoon one quarter of the mushrooms onto each bowl of soup and serve.